Jenny Strain works out of her home, but in my opinion, this woman should be a professional pastry chef. For her cake critique, she brought along 3 flavors of cupcakes. Classic chocolate cake topped with Matcha green tea cream cheese frosting: a most unusual flavor even for me. I enjoyed the texture of the cake--very moist and the frosting had such an usual flavor it was difficult to find words. The green tea flavor was strong but when accompanied with the deep chocolate cake flavor it was astounding. Organic fresh strawberry cake with fresh strawberry buttercream. Simple cake, not too sweet. The cake is delicious accompanied with the light and airy strawberry buttercream. Madagascar vanilla bean cake infused with organic coconut milk topped with coconut buttercream and toasted coconut flakes: at first I thought the green tea cupcake was my favorite, and in fact, at the tasting I said so. But later on, after I took the cupcake home and tasted it on it's own, WOW. I was totally taken back by the richness of the coconut flavors and the creamy texture of the frosting. I can't say enough about this cupcake--it was pure 100% Heaven. 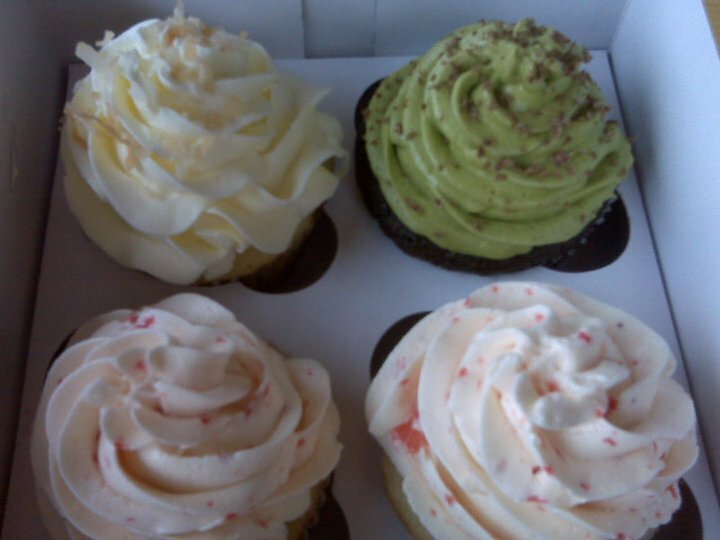 Jenny's Cupcakery gets 2 thumbs up, which I do not readily give to anyone. I would like to try her other flavors and highly suggest this bakery for anyone who wants organic, natural ingredients.